The honourable First Lady of the Federal Republic Of Nigeria, Dame Patience Jonathan is gradually piling up doctorate degree certificates from different sources. 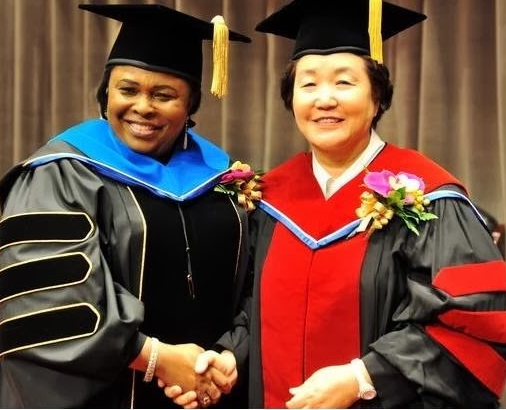 Weeks after being awarded a doctorate degree by the University of Port Harcourt in River state, the big madam was once more honoured with another doctorate degree by Hansei University in South Korea. According to Mrs Sun Hae Kim, the President of Hansei, Patience Jonathan was honoured with the degree due to many good causes. Patience Jonathan Undergoes Plastic / Cosmetic Surgery In Germany ? Congratz our amiable first lady ! @ Damien, watch ur tongue. Dat is God’s destiny for our firstlady, no mata how u abuse her it will nt change anything. She has made it in life, think abt urself. our first lady look like black South Korea too,with small eyes,nice 1 and congratulate Madam. She was awarded a doctorate degree because of her dedication to prayer. I need to spin up М̣̣̥̇̊Ɣ prayer life! Hmmmmmmmmmm! … defender of the poor in Nigeria??? Hahahah I can’t stop laughing. Congratulations to you my good mother. I’m proud of you. @Damian! where our first lady reach, i don’t think u will reach there till u die or any of ur family. Stop all these bad belle. We don see all the wonderful goodies patience has done in your life!!! @ Damien, i dey ya side jare, and no be only cupboard she go use am decorate, make she also decorate kitchen wen she comot aso rock! so hapi for u mummy bad belle pple leav it for her O.. Nw tel me is it her fault dat she is where she is today? Na God O.. so u haters n enemy of progress can kill ursef instanta cos u cant tak her crown xcept her God. Continue ur gud deeds mummy cos God is by urside. Ur english no mata, carry go no send nobody. My president pls dnt send their sayins jst appreciate my mummy and support her d best way u can, above all cherish her. Sophie, Damien, Bezo and Co. You guys are busy bodies, unkind hearted selfish humans. If I were you, I will thank God for the First Lady for the Award. He whom God has blessed no one can demote. The people that gave her know her worth. Uncommon favour is uncommon and can only come from God. She’ll keep her Award wherever she deems fit. Save yourselves the headaches. I just cant stop laffing…..